Poured from a bottle into a nonic pint. A - Hazy golden-yellow, with a two finger snow-white head, which dissipated to NOTHING very quickly. NO lacing to speak of. Surprised this beer wasn't darker. S - Strong aroma of squashed pumpkin, spices (nutmeg, allspice) and even graham cracker pie crust. An odd hint of "wet paper" odor underneath. T - Taste follows the nose, with pumpkin pie spices (nutmeg, ginger, and allspice) taking center stage; especially heavy on the ginger and the allspice. Pumpkin seed flavor lingers underneath. Malts blend with the spices to produce a pie crust flavor, which is nice. Doesn't hide it's ABV particularly well. M - Medium bodied, with medium carbonation. Seems like it could have used a fuller body. O - Tasty, but didn't live up to the hype for me. Nothing really off putting, just really didn't come together as well as I would have hoped. (a little too much ginger, a little too light of body). I'm sure I will be in the minority here, but I like Sam Adams Fat Jack better. Appearance: Pours out a clearish, deep orange body with a tall-standing, frothy, white head. Smell: All rights, friends, so, it smells greatly of oven-fresh pumpkin pie. Who's with me? Who the HAPPY HALLOWEEN is with me? Taste: Sweet caramel malts plunged deep into fresh pumpkin puree and liberally coated in a pumpkin pie spice blend and smoothed over with a touch of vanilla creme. I'm sure it's been said dozens of times over, but it's rather pumpkin pie-like, with the malts even mimicking a flavor of rich, crisp graham cracker crust garnished with candy corn. Subtle hop presence and bitterness. Drying finish with a lingering spiced pumpkin taste and some slight alcohol warmth. Mouthfeel: Medium-plus body. Medium carbonation. Drinkability: Excellent for a pumpkin ale! Look, whoever is giving you advice like, "don't bother with Pumking" is no friend of yours. Take your vengeful fists and clock that mofo in the mouth and spit on their prone, beaten body, because they aren't helping you at all. Oh, and Happy Halloween!! Admitidly, I generally celebrate beers of experimental quality, but disguard those that seem more of a gimmic than quality. Pumpkin beers usually fall in this catagory for me, but beers like this one are quickly changing my perception of what Pumpkin Ales can be... or already are. Pumpking is truely amazing with its bright copper (acturally orange) color, brilliant clarity and lively efforvescence. A creamy head carries a dainty structure yet retains with a sheet across the glass. Low on lace, the beer celebrates the oils and starch that encompass pumpkin beers. From the onset, the beer demonstrates a sturdy backbone of amber (bread crusty) malts and large caramel sweetness. Freshly baked toast, roasted pumpkin, and graham crackers come to mind. A sprinkle of cinnamon, nutmeg, almond, and hazelnut do just enough to emphasize the pumpkin quality in complementary fashion. A buttery praline-like sweetness is just the pillow that the savory crust notes deserve. The body is firm, rich, and non-waivering. Creamy, bready and with a robust spicy sweetness that I would not have expected from a beer this drinkable. The return of graham cracker dryness and aftertaste is all I need to keep comming back. This beer is a gem, comming from a guy who has drank a ton of Pumpkin Ales and haven't enjoyed many. A - Very nice off-white foam head. Brew is delicious clean, crisp golden orange color. Medium viscosity. S - WHOA! Smells like a cookie.... Lots of sugary cloves. Some overwhelming spice too. The worst smelling Pumpkin Ale I've ever had... Smells like pumpkin puke. M - Slightly too much carbonation. Very bitter too. Lingers in a bad way; it doesn't finish clean. O - VERY DISAPPOINTING! Up until this brew, I really enjoyed ST... Not too sure I'll be hunting their others, after this one... Drain pour. Exceptional pumpkin beer, really a great combination of flavorful yet not too heavy. Lighter amber color with some mild lingering head and spotty lacing. Smells great, strong pumpkin, spice, nutmeg, cinnamon, malt. Tastes similarly, along with vanilla and some very mild biscuit. Higher ABV is very well hidden. Smooth slightly creamy mouthfeel, good amount of carbonation. Excellent beer to get into the season! There are no words to express the perfection of this brew, but I will try. As soon as you pour this brew, you are delighted with the aroma and colour it has as it hits the side of your goblet from the bottle and the smooth head holds nice lacing and has very beautiful retention. You take a whiff. This is pure delight. Autumn has sprung! This is fresh pumpkin pie with whipped cream on top. Nothing is overdone here. The spices are perfect, the colour is perfect, and the head is beautiful. The only test left now is the taste. As this liquid hit my lips, my eyes rolled back in pure ecstacy. The mouthfeel is cream and the taste is superb. This is pure thanksgiving that you remember as a child. This is your grandmothers pumpkin pie served to you on your favorite plate as you gazed out the window at the changing coloured leaves while simultaniously opening your first christmas gift. I first experienced the pumking 3 years ago, and I have tried over 70 pumpkin beers since then. No pumpkin beer compares to the Pumking. Blazing bonfire orange with candlelit jack-o-lantern edges. The head looks like a large dollop of whipped cream atop the beer, except it isn't that bright white. How about whipped cream to which brown sugar and orange peel have been added? Mmm, sounds good. Looks good too. An acceptable amount of tattered lace helps the cause. I tend to like the noses on well-brewed pumpkin ales, but this one is simply amazing and might be the best one ever! The usual aromas of pumpkin and pumpkin pie spices are present and accounted for. The thing that makes Pumking sing, though, is an eggnog-like vanilla custard creaminess that makes it smell *exactly* like pie slathered in whipped cream. Fantastic. Although the flavor is a carbon copy of the nose, it doesn't hit me the same way. I'd like to see the vanilla complement the other flavors rather than overwhelm and dominate them. The label doesn't list vanilla as an ingredient, but it has to be in there. What I'm tasting isn't coming from malt, hops, yeast, pumpkin or the traditional spices. The flavor of the caramel malt is buried pretty deeply beneath layer upon layer of gourd and spice (major nutmeg with a sprinkling of cinnamon). I wouldn't mind so much, except that a bolder maltiness might have rounded things out. Sweetness and hop bitterness are evenly matched. It sounds like I don't like Pumking. That isn't it, it's just that it isn't as jaw-droppingly wonderful as expected. Southern Tier is a great brewery, so the bar is set pretty high. For such a high-ABV ale, the body/mouthfeel is on the light-medium side. I hate to say it, but it ventures close to thin on the finish. Carbonation this laid back would have worked in a bigger beer. It doesn't work as well here. 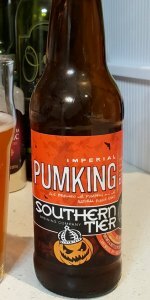 Southern Tier Pumking isn't the best Imperial pumpkin ale that I've ever had (Elysian Night Owl), nor is it the best all-around pumpkin ale that I've ever had (Smuttynose). Still, it's a more than worthy seasonal that lovers of the style owe it themselves to seek out. A: 5/5 Poured from a 22oz bottle into a frosted 22oz mug. Winter is coming and I'm ready for some pumpkin!!! The beer is bright with a creamy head. S: 5/5 Cinnamon, nutmeg, brown sugar, pumpkin, caramel, brown butter, walnuts, gram cracker and the crispness of autumn. What more could you possibly ask for???! T: 5/5 All the pumpkin spice in the world and the booze gives it a rum quality. Fantastic! O: 5/5 Best pumpkin beer ever! I can see why a lot of people enjoy this beer: it smells like pumpkin pie! I rarely like pumpkin beers for this exact reason. I want them to taste like pumpkin, the vegetable, not pumpkin pie, the dessert. The taste is better than the overpowering scent. This beer smells like margarine, nutmeg, and cinnamon. The flavor is more neutral, but I can't say that it tastes like beer. The mouthfeel and appearance are both nice. I won't be asking for this again. I prefer Dogfish Head's Punkin Ale because it's more vegetal and less dessert-scented. This beer would be great for someone who doesn't mind a sweeter beer with some artificial notes. Huge thanks to mjtiernan for sending me this one! Pours a clear light copper orange with a 1 inch fizzy orange-white head that fades to an oily film on the top of the beer. No lacing on this one on the drink down. Kind of a disappointing appearance. Smell is very complex with caramel malt, biscuits, actual pumpkin puree, and a wide array of pumpkin pie spices - cinnamon, clove, nutmeg. Taste is of malt/bread/biscuit/crust, unsweetened pumpkin puree, brown sugar, and the aforementioned spices. There is a slight spice bitterness that sticks the the tongue after each sip. This beer has a higher level of carbonation with a crisp and dry finish. Overall, this is a good pumpkin ale that is somewhat different that I was expecting. I was thinking that this could be a creamy, sweet pumpkin milkshake of a beer but I like this one as it is. A-Pours a brilliant orange color like a fresh pumpkin, frothy white head with loads of bubbles throughout. T-Pumking is right this is not light on the flavor of pumpkin, nutmeg and cinnamon is there as well as a kind of vanilla cream taste. M-Good throughout medium body, to me it has a bit of a sharp finish that im not particularly fond of maybe from the spice, flavor hangs around for a bit which is nice makes me want to comeback for more. O- My favorite pumpkin beer, it's one i get excited to drink for both the flavor and the time of the year it signifies. Delicious taste, beautiful color. 650ml brown glass bottle with standard pressure cap served into an Odell pilsner glass in me friend's gaff in high altitude Fort Collins, Colorado. Reviewed live. Expectations are fairly high given its reputation. Served straight from the refrigerator. Side-poured with standard vigor as no carbonation issues are anticipated. A: Pours a one finger head of beige colour, nice thickness, nice cream, and fair retention. Body colour is a very pale copper. No yeast particles are visible. No bubble show. Somewhat dull. Sm: Heavy pumpkin gourd. Some spice, maybe some gourd. Generic middling malts. An average strength aroma. T: Tastes like pumpkin. Some brown sugar. Gourd. Hints of spices. Balanced but lacking. I do like it, but it is horrifically simple. Mf: Smooth and wet. Good carbonation and thickness. Good palate presence. Dr: Arguably simple but still satisfying; if you want pumpkin, you'll get it. Drinkable and enjoyable but lacking complexity and subtlety. I like it, but I doubt I'd have it again. What can I say that hasn't already been said. I have 2 bottles in my cellar waiting for Halloween! This is the bar by which all seasonal pumpkin beers are measured. If you make this your first pumpkin beer, there's almost nowhere to go but down. Beautiful amber/orange color. The scent is at Breakfast Stout level in that it's pretty much as enjoyable as drinking the brew. Brilliant, sophisticated array of scents of pumpkin, spices, pie crust, so well balanced and harmonious. Few beers offer an olfactory experience that's this magnetic. That smell is picked up in the taste in a seamless drinking experience. Pumpkin beers always struck me as a novelty style, so I was always skeptical and hesitant to try them. The first few I had were okay, New Belgium's Pumpkick is similar to this one, but much more cinnamon-leading. Pumking is in the absolute top tier of this niche style. T -- Tastes fairly similar to how it smells, but there is a sharp boozy note to this brew that lowers its taste score considerably. Wow. This is one nasty beer. Tasted like an artificial flavored gummy bear or jelly bean. Pumpkin pie crust in a beer? This has it. Various pumpkin pie spice "flavors" but chemical in nature. I could not get past the artificial nastiness to take any other "qualities" serious. I will never buy this again. Blech. Entirely too sweet and chemically - tastes like they mixed in a pound of Sweet n Low + dry cleaning fluid. Avoid this like a rancid, post-Halloween pumpkin. A: The beer is cloudy amber-orange in color and poured with a finger high white head that quickly settled into a thin layer of bubbles consistently covering the surface. A medium to high amount of carbonation is visible. S: There are inviting aromas of sweet pumpkin pie in the nose, which almost makes this beer smell like a dessert. T: While there is some malty sweetness and flavors of pumpkins and spices in the in taste, these are nicely balanced with some hop bitterness. M: It feels medium-bodied on the palate with a moderate amount of carbonation. D: The beer is very easy to drink because the sweet flavors in the taste aren't cloying because of the underlying hops and the alcohol content is very well masked. Mostly see through golden with an orange tinge and slight head. Lots of carbonation bubbles seen rising. The scent from the bottle really concentrates malt and pumpkin and I enjoy this smell. That scent can really be tasted on the ending of this beer. What strikes me is the range of flavor from this beer. Initial flavor starts slightly sweet and changes to spice and then to pumpkin and malt in the finish. I get some heat with this beer as I sit here along with some sight back of the palate bitterness. Medium feel with slightly less carbonation. This is a powerful and unique brew. Pretty good. I get a roasted pumpkin flavor with vanilla and spices. They do have seemed to change the recipe from last year though- seems to be more of a hop presence which I like because its balances the sweetness. Poured from a 22 oz bottle. Vibrant copper, dense amber color with a small white head that transformed into a thin layer of bubbles resting at only the edges of the beer along the glass. Not much lacing to speak of when all was said and done. The aroma was full of pumpkin spices, cinnamon bread, and toasted malts. It wasn't noticeable at first, but about halfway through, after the beer warmed up a bit, hints of vanilla bean came out, along with a (very) mild bitterness from the hops. The taste followed the smell pretty closely, with pumpkin, yeast, malt, and maybe a bit of vanilla - very "holiday" smelling. Carbonation was medium, the body was slick and a little too heavy to be called "thin", and the higher ABV was hidden pretty well. Overall, a good pumpkin beer. I'm not a huge fan of pumpkin flavor beers, but I still enjoy trying them. This one isn't bad, but I'm still searching for that one that changes the way I look at pumpkin beers forever. Poured from a 1pint 6oz. bomber into a Allagash flute. The color is a clear deep copper with s finger of brownish/tan head and some nice lacing left on the glass. The smell is sweet with a big brown sugar aroma. There is some pumpkin spice aroma here in the nose with a nice dough aroma mixed in. The taste is pumpkin but has a juicy flavor like a fruit instead of a vegetable. The is some nice spicy flavor here like brown sugar and cinnamon. There is even a slight orange peel flavor that comes out toward the back. The feel of this is actually medium to light bodied. This is a lot to this beer but it is highly drinkable and has a nice juicy feel that hides the higher ABV of this beer. Picked this one up finally thanks to a very generous BA who sent me down a couple of them. I had been waiting forever to try this one, and missed out on it last year. Served cold, right out of the fridge per instructions. It was served in an oversized wine glass and consumed on 09/22/2008. The pour was simply stunning. A very rich and very hazy looking orange liquid came gurgling out of the bottle, hitting the glass with decent enough force to throw up a nice two inch layer of off white head. Nice retention kept this one hanging around for a good long while before finally settling down into a thin layer of white across the top that stayed until the very end and left behind a very nice layer of side glass lace. The aroma was about as rich as you can get. This was the most decadent, dessert like beer that I have ever run across. This smelled more like a pumpkin pie then my grandma's ! Super sweet with lots of gingerbread, and sweet cookie goodness. This was about as good as it gets. Translated over as perfectly as you could have imagined into the flavor. Huge notes of cinnamon, pumpkin spice, gingerbread, everything you could imagine. This was just colossal with no hint at all of any abv. Rich and decadent in the taste and well as the feel,. The only drawback was this was soo rich with sugar it was hard to drink too much of it as it became a little bit tough after a bit. Aside from that this was about as good as it gets. Overall, wow. I have never tasted anything like this it was just tremendous. This was the most perfect fall dessert I could think of. Rich, sweet, decadent. This was better then I ever imagined it would be. Overall I was floored and would have to recommend this to anyone!